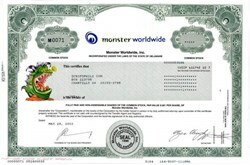 Beautifully engraved low serial # certificate from Monster Worldwide . This historic document was printed by the United States Banknote Company and has an ornate border around it with a vignette of the Monster Company logo. This item has the printed signatures of the Company's President and Secretary. Founded in 1967, Monster Worldwide, Inc. (formerly TMP Worldwide Inc.) is the online recruitment leader and the parent company of Monster, the leading global careers website. Monster Worldwide is also the parent company of TMP Worldwide Advertising & Communications, one of the world's largest Recruitment Advertising agency networks, and TMP Worldwide Directional Marketing, the world's largest Yellow Pages advertising agency and a provider of direct marketing services. Headquartered in New York with approximately 4,500 employees in 19 countries, the Company's clients include more than 90 of the Fortune 100 and more than 490 of the Fortune 500 companies. 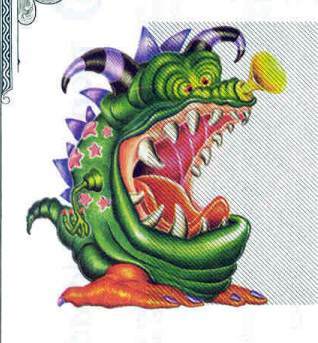 Monster Worldwide (Nasdaq: MNST) is a member of the S&P 500 Index.